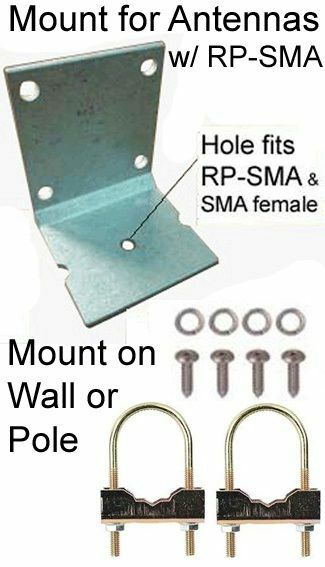 Nut and washer for RP-SMA-female and SMA female connector: Bulkhead nut & washer to mount connector on enclosure or PCB. 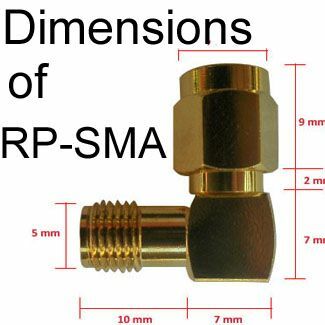 SMA and RP-SMA use the same hex nut and washer set. 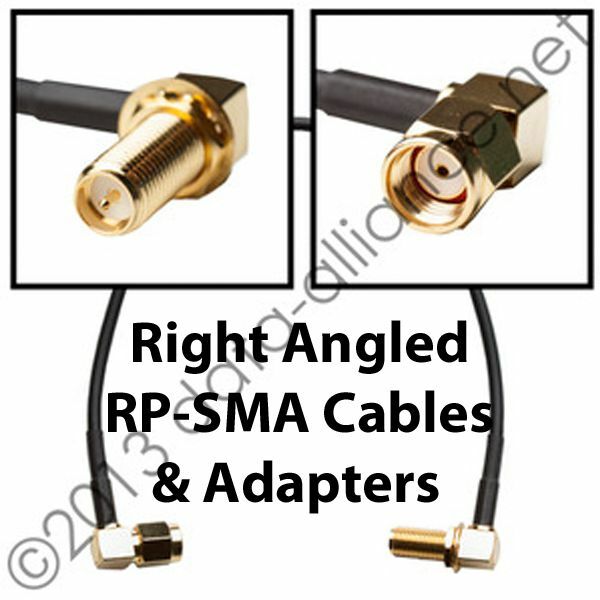 Enable the connector to serve as a mounting device, such as to mount the cable to an enclosure, case or Printed Circuit Board (PCD). 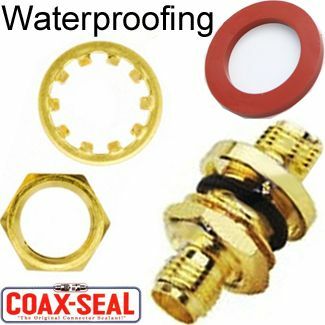 Weatherproofing: Seal the hole where the connector is mounted, by placing an O-ring between the wall of the enclosure and the O-ring. 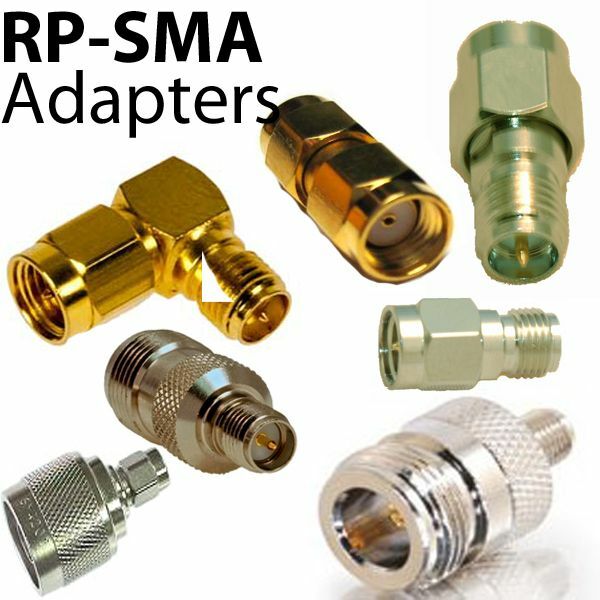 Waterproof Rating: Using this O-ring with the bulkhead nut and washer (100% brass version) on an SMA or RP-SMA-female connector results in the connector having an IP68 rating. 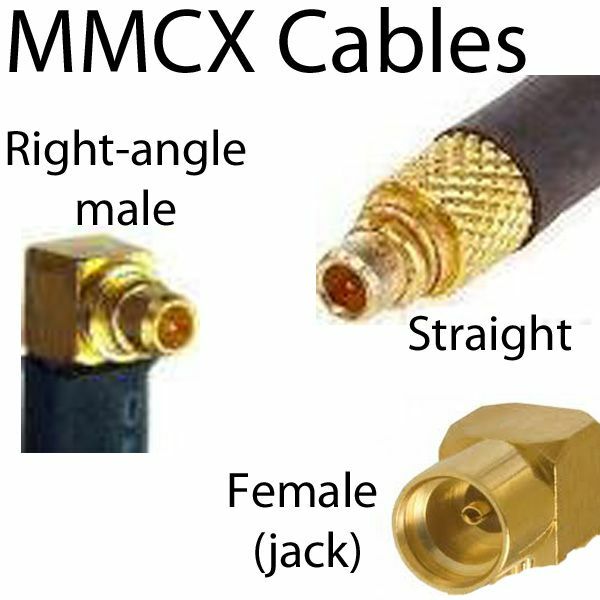 The bulkhead does not in any way interfere with the ability of a female connector to properly "mate" with a male connector: In other words, a female connector with a bulkhead mates/connects exactly as well as a female connector without a bulkhead. The hex nut for SMA and RP-SMA measures 5/16 inch (0.3125 inch / 7.9 mm) across opposite flats: The SMA wrench that fits it is the same wrench as for a #6 SAE hex nut. The bulkhead set includes one nut and one washer. 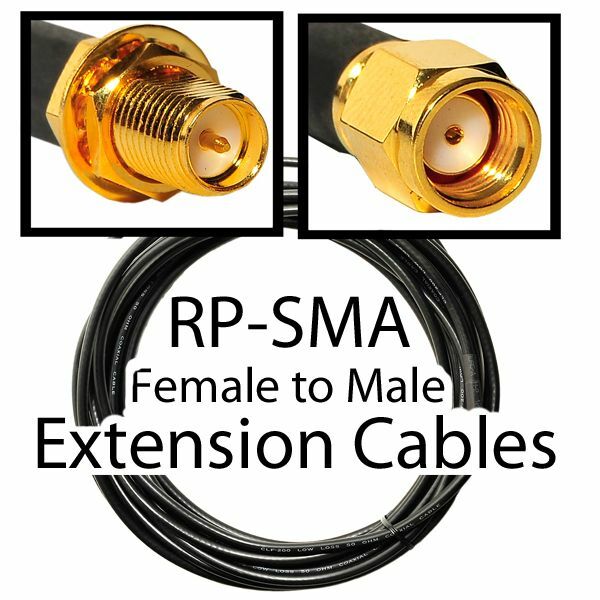 The inside diameter is 6mm, to clear the threads on the female connector. Rubber waterproof O-ring seal can be purchased by checking the checkbox above or purchase as a standalone item. 2) The brass is kept away from oxidizing materials that include cyanides, ammonia, dichromates, and nitric acid. 4) The components are kept away from salt, chemicals in the air, tap water, and rainwater. a) Brass alloy Components and equipment that are outside will lose their luster faster than those kept inside in a dry building, which can remain shiny for years. b) Components near roads that are salted frequently, or near any marine or salty environments will corrode faster than those near freshwater water bodies. c) Brass alloys submerged in water will lose their zinc component faster and become fragile as compared to those exposed to just air. Outside of situations where you need to submerge the metal in water, brass is excellent for outdoor applications as it is one of the most corrosion proof metal alloys. Once its surface is oxidized and changes to a blue-green hue, it can last for hundreds of years without corroding or losing its structural integrity. Brass is an alloy that has zinc as the major alloying element alongside copper. The proportions of the two metals can be varied depending on the properties one is looking to attain the final metal. Zinc can be added to the copper in amounts from as low as 5% to as high as 45%. The corrosion resistance of the brass will typically reduce as you add more zinc to the alloy. Rustproofing for brass is not the same thing as what you do for metals such as aluminum, iron or stainless steel which contain iron. Brass does not contain iron and hence it does not rust in the true sense of the word. Brass corrodes. Brass will react with air to form a copper oxide which is a dark grey corrosion film that covers the metal and prevents further damage. The film can be washed away by abrasive materials such as salt water, industrial chemicals, and even fast flowing liquids, leaving the metal vulnerable to more corrosion. Brass can also corrode through dezincification where the metal loses its zinc content when exposed to alkaline, neutral and acidic media. 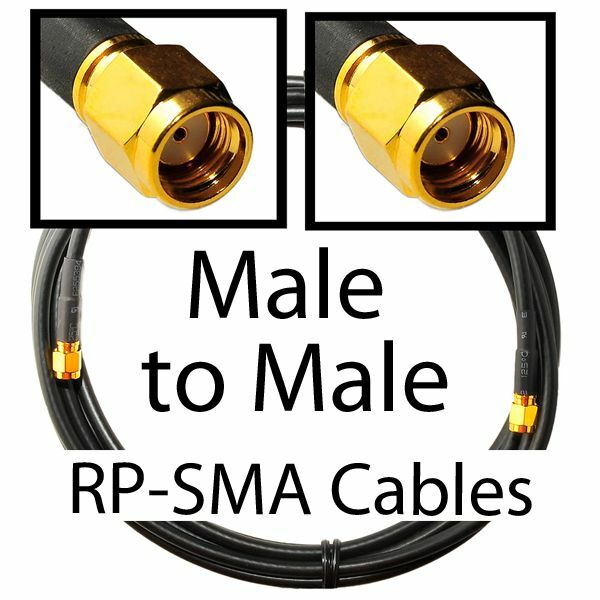 I was looking for these for my quadcopter, looked everywhere local to no avail, looked online and they wanted to sell in bulk. Data-alliance had only what I needed and shipping was fast. Highly recommend. They fit my VTX perfectly. I was looking for these for my racing quadcopter, looked everywhere local to no avail, looked online and they wanted to sell in bulk found data-alliance and bought only what I needed and shipping was fast. Highly recommend.